Michelin and Total join forces to launch a major road safety programme for 10-18 year-olds. Home/Announcements, News, Press Releases/Michelin and Total join forces to launch a major road safety programme for 10-18 year-olds. Total and Michelin, leading players in global mobility, are launching a major road safety education program for 10-18 year-olds via their corporate foundations. 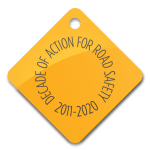 This project, developed with the support of Global Road Safety Partnership, aims to reach 100,000 young people over a 3-year period. The Total Foundation and the Michelin Corporate Foundation have decided to contribute 1.5 million euros jointly to this initiative. Throughout the world, road accidents take the lives of over 227,000 young people under 20. In fact, it is the leading cause of death for 15-17 year-olds. Determined to make a real impact on sustainable and safer mobility, this unique cooperation between Total and Michelin will launch its initial phase in France, Cameroon and India. The plan is then to rapidly expand to other countries and welcome new partners into the program.